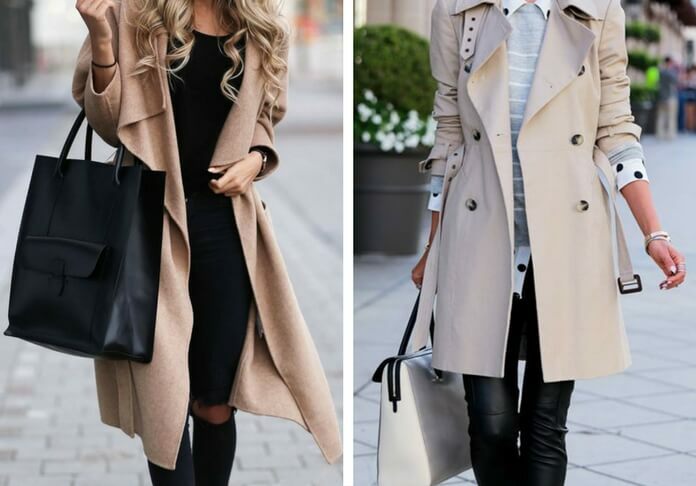 Trench coats are an absolute must-have for mid-seasons such as spring and, mostly, fall time; and it’s very easy to find your perfect coat, since trench coats are available in an extremely wide range of different textures and textiles, from suede to denim, from classical neutral beige to bright yellow or peach pink. Read on to discover the hottest trench coats on offer for this fall. This outfit is very easy yet extremely stylish and beautiful. Matching black and white is an eternal classic, and it can be perfect not only during daytime, but also in case of elegant evening occasions. Just a simple white pullover paired with black skinny jeans and optical white stilettos, everything finished off with an extremely long black trench coat. This outfit is layered on grayish tones, with a light-gray trench coat in heavy textile, perfect for winter, and a light t-shirt in melange gray, together with suede gray heels. Light blue denim jeans are perfect for this outfit since they dress down the whole look making it perfect for daytime and work hours. The typical trench coat color is easily worn during daytime with a totally black, almost no accessories but a big leather bag, and vintage pink sandals made by simple leather lists. This outfit, perfect for elegant events, has almost the exact same colors of the previous one, and with a slight change in materials and shapes shifts from daytime to night in just one second. The coat is ankle length, a must have for this fall, and has a pink undertone which represents another of the best trends of this season; pants are in leather material, and shoes are made more aggressive with a pointy toe and shiny jet black color. The coat shown in this outfit is one of the most classical ones; neutral light beige, brownish buttons, defined structure and a belt around the waist, it is not easy to wear in an original yet stylish way. But put together with a striped pullover and a polka dot shirt in contrast, and aggressive leather pants and gladiator style pointy toe heels, it soon becomes and detailed and carefully designed an outfit for the ultimate fashionista. This beautiful coat, carefully made and perfectly structured, is enough to build a stylish fall outfit by itself and doesn’t need much else to surprise people. Moreover, blush pink is for sure one of the pink trends of this year. Burberry, as we all know, is one of the kings of trench coat: so here it is a beautifully designed and realized khaki trench coat, in a dark and deep nuance which is simply perfect for fall, to pair with neutral tones to finish off the perfect daytime look. Bright red is another trend in this fall time: and wore on this gorgeous wide long trench coat is enough to light up even the darkest fall weather. Pair it with a simple total black outfit, as shown in the picture, to go perfectly smooth and stylish, whether it be daytime or evening. This trench coat is, again, from and old Burberry collection: but what’s more up to date than an overall pattern made by little hearts in neutral tones? This trench coat can be worn easily during day and night, and it’s perfect on its own with earthy tones clothes underneath and flat shoes to finish off everything. This wonderful coat is structured and characterized by a tiny waist, tight shoulders and top, and a long wide bottom line which makes it perfect to underline womanly figure and hugging the body in a beautiful shape. Black and white makes it easy to combine with other garments, such as beige and neutral colored clothes, and the pattern is perfect to not get away unnoticed. Total denim outfits have been around for a while now, and they are going to stay a lot more: in fact, this is one of the trends that will go on for next season, and it can be easily declined with an extreme variety of different garments. For fall, this oversize trench coat is super trendy and perfect for daytime, or for a grungy underground look in special events. Suede is still one of the trendiest materials you could use this fall: and what could be better than a knee length camel trench coat? This warm color is easy to combine and yet stylish on its own, and it can be easily shaped with the belt around your waist, or left open for a more ‘street style’ casual look. This trench coat is perfect if you live in colder weathers and simply can’t go through fall with just suede or denim: this tweed trench coat is going to keep you warm and super comfortable with its furry applications, and it’s perfect for transitioning into winter. Dark grey tones are perfect to combine, and the bright belt will light up the look instantly. Leather is in almost every season of fashion, and it’s a staple that every woman has in her wardrobe, whether it be shoes or pants, jackets or accessories: but a trench coat in black leather in an absolutely amazing garment that can be elegant or aggressive, versatile and interchangeable, just depending on what you pair it with. To be sure, use it in a total black outfit to be super stylish and simply perfect. Who could give us the ultimate trench coat inspiration if not Vogue, the bible of fashion? This trench from Theory ready-to-wear fall 2016 collection mixes two of this fall must haves: spicy mustard color, elected among the fall colors from Pantone, and leather, a timeless material perfect for every season, as we said before. This trench is beautifully crafted, has a clean and light clear structure, perfect for a classy woman who knows how to combine and wear such an important color, resulting at the top for autumn style.